Can SEO generate business for SaaS companies? 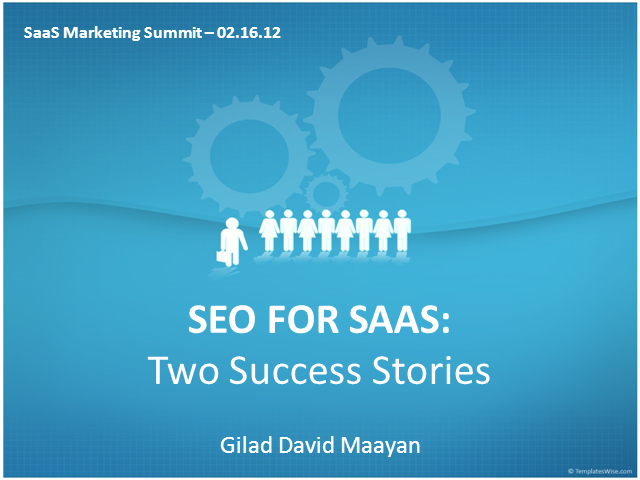 How is SEO for SaaS different from SEO for software or consumer products? Gilad David Maayan reveals the SEO strategies that changed the bottom line for two SaaS providers: Xeround, a MySQL cloud database, and InterFAX, a fax service for enterprises. Learn how keyword research, on-site optimization and link building are done successfully in SaaS markets. Gilad leads SEO strategy at Agile SEO, a boutique online marketing agency focused on SaaS and technology clients. He has done SEO, marketing and content for over 100 technology companies including Clicktale, Oracle, GigaSpaces, Check Point and Amdocs, and is the winner of 3 international awards for pioneering work on wiki documentation as a marketing tool.